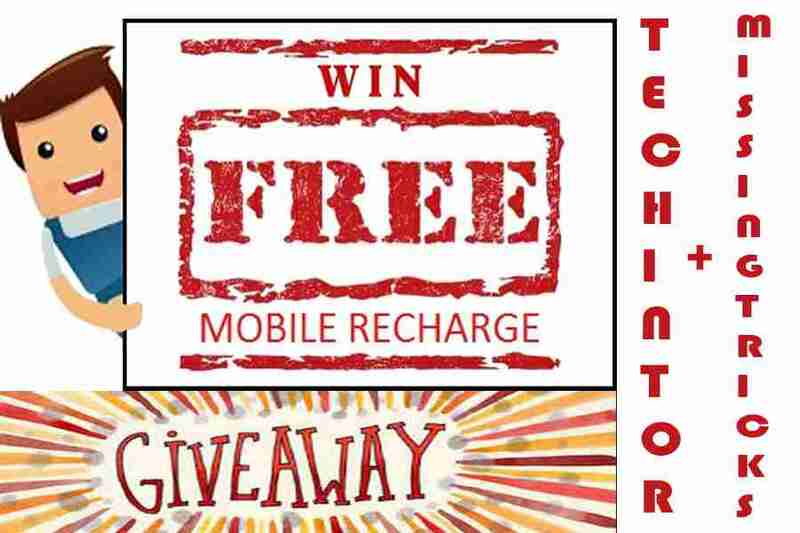 Hi Techintor.com fans, We are glad to inform you that today we are starting a Free Recharge Giveaway program for our visitors.I am very Thankful to every user of our blog, Techintor.com for make this Giveaway possible. This is our first Giveaway and we partnered with Missingtricks website for this recharge giveaway. You need to complete some simple tasks to win this exclusive giveaway. Go ahead and try your luck. Read full steps and instructions before participating our giveaway. Hope you guys welcome this and make our first giveaway a great win. CONGRATULATIONS TO ALL WINNERS. WE SEND A MESSAGE TO ALL WINNERS [ FB OR GOOGLE+] FOR GETTING DETAILS OF RECHARGE. RECHARGRES WILL BE DONE AFTER 24 HOURS OF GETTING RECHARGE DETAILS. RECHARGE PROOFS WILL PUBLISH SOON. 50 Rs Recharge for 10 Lucky Persons. 20 Rs Recharge for 20 Lucky Persons. 3. Comment down your Lucky number in between 1 – 2000 [On below blog Comment Box, SCROLL DOWN TO BOTTOM], Before commenting assure that the number you are going to be commenting is not used by any other users. [ So double check the previous comments]. Also add your Facebook id url link with your lucky number. Also Participate on Our partner website Missing Tricks giveaway and double your chance to win. For any queries or suggestions related to this giveaway use contact us page. So guys, Participate now and earn free recharge. Thanks for visiting. Thank you for participating. Please check your fb id once again. you are entered it wrongly. You are not commented with your email. You will be disqualified. Thank You For Participating… will notify you after winners announce. Hi jack, thank you for participating.